Congratulations to newly qualified Dive instructor Emily Simpson. Emily has been working with Wolf Rock Dive since February as a divemaster (dive guide). 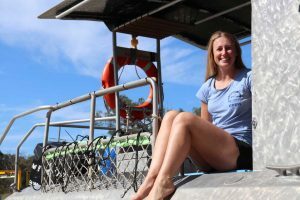 She became a valuable team member and Wolf Rock Dive were happy to assist her in completing her Diving Instructor course in Cairns last month. A Rainbow Beach local, Emily has lived in the area all her life and been involved with the Surf Life Savers club since the age of 13. Emily is a Patrol Captain for her team and has held some positions on the committee (including Youth Development Officer, Surf Sports Officer and Summer Surf Girl). “I also helps out on surf training camps,” Emily said, having become a Trainer for Surf Life Saving, which connects to being a Dive Instructor. “I get to teach people skills in areas that I love, sharing my knowledge and abilities,” Emily shared. A natural water girl at heart, scuba diving has come naturally and, despite traveling all over the world, spending time living and working in South east Africa, Emily felt the pull of home and now knows she doesn’t want to live anywhere other than Rainbow Beach! Now as a fully qualified instructor Emily is teaching advanced dive courses out at Wolf Rock, as well as guiding certified divers. “I hope to introduce some of the like-minded young life saver crew to take a ‘try dive’ in the swimming pool and progress on to completing their Open Water Courses with Wolf Rock Dive. We have such an amazing dive site right on the doorstep, with resident grey nurse sharks, numerous types of stingrays and an abundance of fish life every day! It is really special to be able to share this world class dive site with the locals that live here. Congratulations to Emily on all her hard work. If this appeals to you, Wolf Rock Dive is taking new applicants for summer – call 07 5486 8004 to find out more.